Children who have developmental delays or special needs often need help to improve their overall communication skills. Children who cannot express their wants and needs can become frustrated and demonstrate various behaviors to try and express themselves. A Speech and Language Pathologist (SLP) treats articulation and language delays, so the child can more easily share his/her wants, needs and feelings. If your child has feeding issues, a SLP can help make meal time an easier and more enjoyable experience for your child. 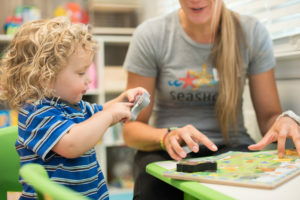 At Seashore Pediatric Therapy Center, we develop a treatment program that is specifically designed for each client and create a fun, enthusiastic learning environment that is rich in communicative opportunities, aimed at developing your child’s area of weakness. Through interactive games, puzzles, and floor play, activities are designed to improve your child’s underlying areas of weakness in expressive/receptive language, feeding/swallowing, and overall communication deficits. Interventions and sessions focus on crucial, every day skills that are important to the needs of both your child and family. 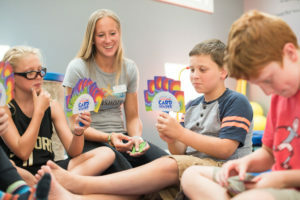 At Seashore Pediatric Therapy Center, we recognize the importance of family involvement and education to ensure carryover when and where it really matters, at home and school with family and friends. Following an evaluation to assess each child’s strengths and areas of need, goals are formulated, and speech therapy is initiated to assist the child in reaching these goals. While speech therapy is goal-oriented and centered on each child’s individual areas of strengths and needs, each session allows not only for structured therapy activities, but it also encourages the child to express his or her own preferences while selecting these activities. The key to pediatric speech therapy, as with therapy in general, is to challenge the child while fostering a warm and welcoming environment. The child thus develops skills while having fun at the same time. When these two aspects of therapy remain in balance with each other, the child is able to make sustained progress toward the goals and ultimately the child is able to maximize his/her potential.